I saw it last Friday and then I spent the last seven days aching to see it again. I planned on going with my mom and Grandmom ("Grandmom would love this! We should take her to go see it!" she exclaimed, trying to mask her quiet desperation.) Ultimately they both backed out on me, so I went alone. Which is actually really okay, because to be honest I like seeing movies by myself more than with friends or family. Is that weird? I feel like in our culture, movie consumption (at least in a theater) is generally considered to be a group event. We read books alone, listen to music alone, watch television alone, but movies are supposed to be a communal activity. We should have someone who can discuss the movie afterwards and help us not look like a loser beforehand. But there's something so awfully freeing about sitting in the darkness alone and not caring what your fellow movie-goers think of your reactions. I don't generally cry during movies, but I have an awful habit of smiling - like a giant, ear to ear grin - when I'm enjoying a film, and I get very self conscious about it when I'm part of a group. So tonight when I watched The Man From U.N.C.L.E. alone (although technically surrounded by about 50 senior citizens) I could grin til my face ached and it was heaven. Long story short (actually, I think this post is too long for me to say that at this point) you should really go see The Man From U.N.C.L.E. If you like classic films from the 60's, spy movies, 60's fashion (OMG the fashion in this movie, I die! ), handsome guys and spunky girls, you'll like this movie. I promise. Pinky swear! Just go see it! Now let's circle back to Modesty Blaise real quick, because this post clearly isn't long enough yet. I got back home after MFU, simultaneously energized from getting to see it again and despondent that I didn't have it on DVD yet. I have a very obsessive personality when it comes to media, I love listening to the same song on repeat for weeks or watching reruns of the same tv show (not the same episode though, in my defense) every night for years (hi there, 30 Rock!) and I'm the same way with movies. Rather than seeking the help I probably really need, I decided I had to do something to fill that gaping "I need to watch this as many times as humanly possible" hole in my heart. Modesty Blaise is a fun 60's spy comedy with a very vague plot, spectacular outfits, insane dialogue (Dirk Bogarde really gets the best lines in this, and his over the top delivery is side-splitting hilarious. "Tor-cha!") and wacky randomness like sudden hair color changes or fishes swimming in giant champagne glasses. I think it tends to get a bad wrap because of the confusing plot, but many a great film makes absolutely no sense. Between you and me, I'd rather watch and not understand Modesty Blaise than watch and not understand 2001: A Space Odyssey. What is the floating space baby?? 1. 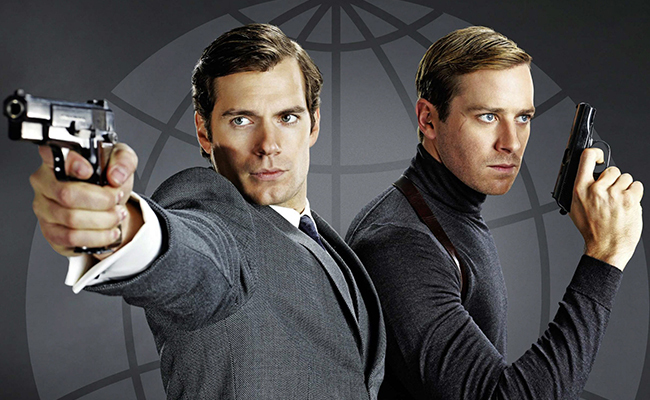 Go see The Man From U.N.C.L.E. You won't be disappointed. 2. Feel free to crush on Napoleon Solo. Illya is taken. MINE. 3. 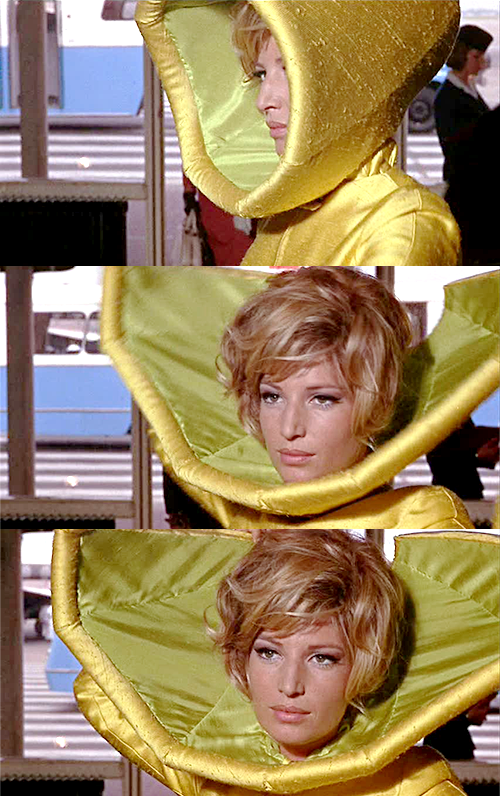 Also watch Modesty Blaise. Expect lots of cool, very little sense. 4. Seeing movies alone is fun! 5. Writing posts at 2am might not be a great idea for me anymore. 6. Floating space baby is creepy. EVERYTHING ABOUT THIS. TEARS. GLORY. I CAN'T. WORDS. YES. You are hilarious and wonderful. A COOL 60S LOVING MONSTER. Also, those six points. Perfection. Seeing all the seniors was so funny since you had *just* said that old guys and us two were the only ones who were obsessed with this movie, lol!!! I saw MFU for the second time yesterday, and that second viewing bumped it up from "like" to "LOVE!" for me. I want to go again next weekend. It's so fun! I adore it. And Illya made me cry. That whole "I've just be told to kill this guy who is possibly the first friend I have had in my whole miserable life -- I'm Going To Smash Everything!" scene. I cried. Poor, dear Illya. Have you been having awesome audiences at your showings? Both time mine were mostly senior citizens, and they laughed and guffawed at all the right places. I generally prefer to see movies alone, and only have a couple people that I truly enjoy seeing movies with in the theater, who I can count on not to a) look at me while I react to the movie, or b) talk the whole time. To my mind, there have never been actors as dropdead beautiful and cool as those of the late 50's and 60's. Anna Karina. Anouk Aimee. Jean Seberg. Monica Vitti. Claudia Cardinale. Jeanne Moreau. On and on. For example, that lovely moment when Aimee and Jean-Louis Trintignant and their children are on the ferry in A Man and A Woman, their hair whipping around in the cold wind, and we see their hesitant hearts beginning to find each other--well, that moment is worth Julianne Moore's whole career. But I appreciate that you find such moments over many decades. I'm really glad you loved MFU (I was going to see it again this week but was too tired). I've been waiting over two years for that damn movie but, luckily, it was more than worth the wait! One of my friends loves the show & was really disappointed with the characterisation of Napoleon, but my two best friends loved it as much as I do, so we've been flailing over it (although, yes, I really like seeing movies alone, too).